Unlike emergency communications systems designed for single applications (like elevator emergencies or ATM troubleshooting phones) CASE Emergency Systems Blue Light Tower Phones, E-phones, Emergency Call Boxes, and other wireless security solutions are designed to work in a wide variety of situations and locations with the same, reliable performance each and every time they’re needed. 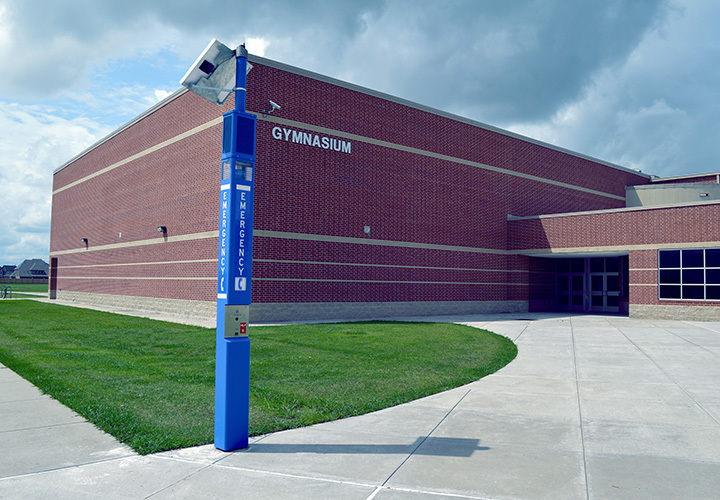 Our products are made in America from superior quality components and proven technological advancements to ensure many years of dependable use and simple one-touch connection to emergency authorities. 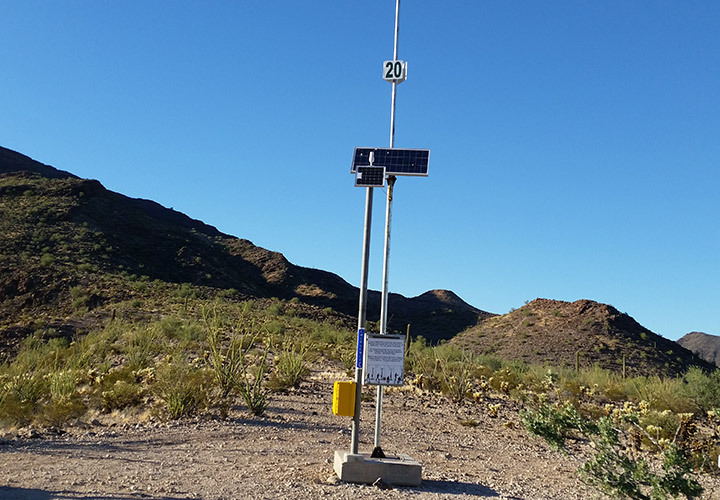 The latest generation of our public safety communications equipment is also designed to be simple and easy to install – with no trenching or wiring necessary (unless desired) – making them the perfect solution for almost any destination where people may need help. Because our equipment is made and assembled 100% in the USA, you have access to the original equipment manufacturer (OEM) for all your service, support, upgrade, and other requests. 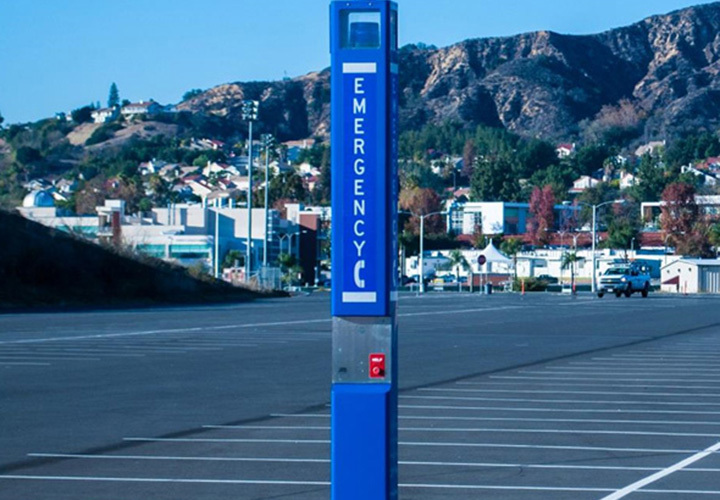 All CASE Emergency Systems products are designed to install with no trenching or wiring necessary – so it’s fast and simple to set up a reliable emergency communications system wherever you need it. Hospitals, urgent care facilities, outpatient diagnostic centers, and medical office parks often have limited cell-phone reception due to imaging equipment and thick walls. Or, certain areas of the facility may be designated as “no phone” for the safety and comfort of patients. There is also the very real occurrence of people who require emergency assistance prior to reaching a reception desk or front door. An emergency phone or Blue Light Phone allows anyone to connect to help regardless of where the event occurs. Large terminals and underground terminals can present numerous challenges for typical communications. Elevated trains and bus-shelters are hard to visually patrol from the ground. 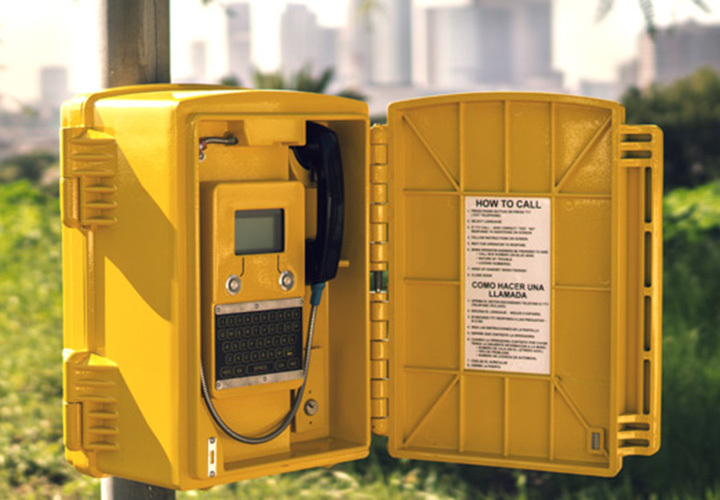 As public payphones are routinely decommissioned – there are increasingly fewer ways for commuters to notify authorities of crime, vandalism, fire, or other safety hazards. 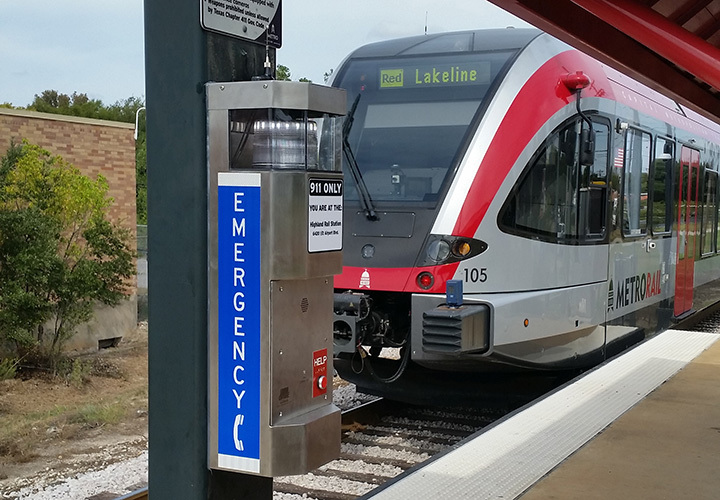 Emergency public safety communications equipment keeps public transit safe for all. Walking to and from a vehicle is one of the most common places a person may be robbed, assaulted, or abducted. 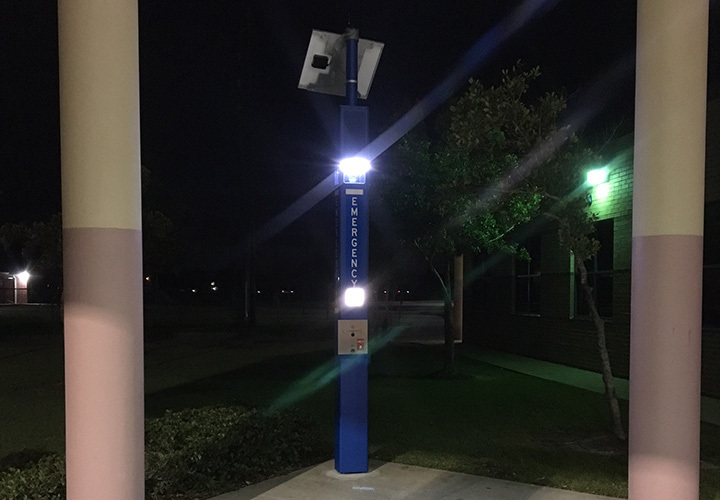 With a one-touch emergency blue light phone in place, authorities can be contacted immediately without running inside a building, or fumbling for a personal cell phone while precious seconds tick away. Campus safety is non-negotiable for colleges and universities across the country – and though safe-ride programs and increased campus police and security patrols are excellent components of a robust safety program, there’s no substitute for a wireless emergency phone system outside libraries, in parking lots, outside rec centers and dining halls, or in other remote areas of campus where students and faculty may need help. Simply adding more bodies to police, fire, rescue, and other first responder teams also adds substantial budgetary expense that may or may not be sustainable for your city or town. Installing emergency communications systems, on the other hand, is a single installation that works round the clock, 365 days a year in the locations you designate – ready to make help available at the push of a button – for years to come. 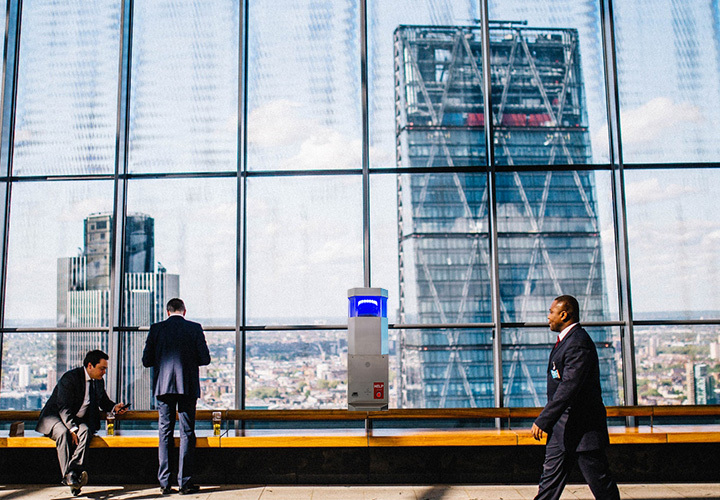 Business parks and plazas, commercial high rises, and even large corporate headquarters and facilities are home to thousands of interactions a day. Theft, fire, injury, failure of vital building systems, and more can all happen without notice at any time. Thankfully, with an emergency blue light tower phone, e-phone, or other wireless security solution in place – people don’t have to wait until reaching an office or finding a reception desk to get in touch with emergency assistance. Many primary and secondary schools around the country widely support a “No Cell Phones at School” policy for students. 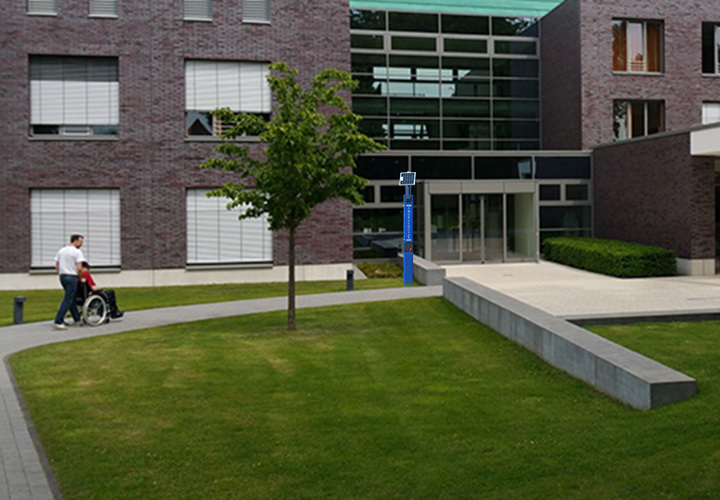 And while students are always free to use the main office phone to call home for forgotten homework or when feeling ill – emergencies often happen away from easy office access. 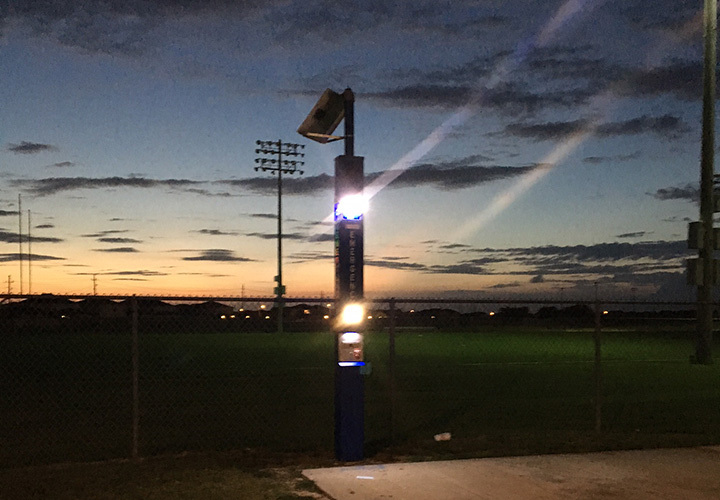 An emergency Blue Light Tower, wall-mounted E-Phone, or emergency call box placed where both students and teachers can access it near PE fields, locker rooms, cafeterias, parking lots, or portable buildings provides for a safer, more secure learning environment for all. Getting outside or connecting with nature can often leave people disconnected from quick emergency response. Wireless Emergency Phones placed in strategic locations can help visitors deal with problems ranging from everyday emergencies like a playground injury to more large-scale unexpected events like a collapsed concert stage or carnival ride malfunction, to any number of crimes, including bicycle thefts, assaulted joggers, child abductions, dangerous wild animals, and more. The more automated the world’s shipping warehouses become, the less oversight there is for dangers arising from hazardous materials or problems with sorting equipment and racks. 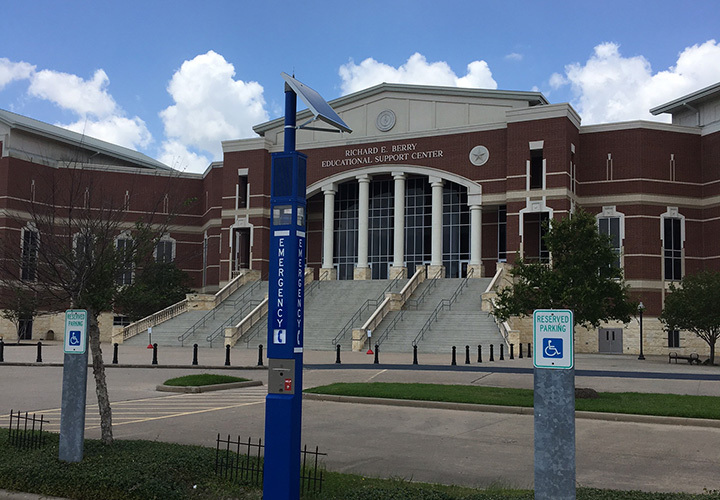 Emergency Blue Light Tower Phones or other emergency communications systems can connect even small on-site teams and security personnel with emergency authorities in these situations – as well as in those such as would-be thefts of property or vehicles at the location. Bring together tens of thousands of people into a single location with steep stairs, tight seats, and limited access in and out of the building, and sooner or later an emergency is going to occur. Wouldn’t it be reassuring to know that just around the corner, there’s an emergency communications point that will help someone alert police or fire & rescue – possibly saving lives and preventing injuries to those in attendance? Boating and marine accidents are some of the most difficult for emergency authorities to address effectively because it often takes a long time for someone to report a problem. 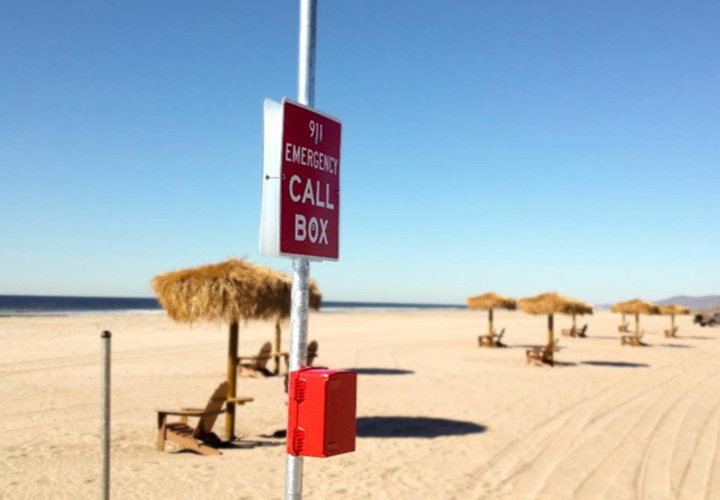 An emergency phone system at your marina, dock, riverwalk, port, or other waterfront location can serve as a vital relay point for distress calls being radioed in from the water, or for those on land who’ve wisely left their other electronics devices at home rather than risk them getting wet or destroyed. Dehydration, stroke, heart attack, lightning strike, injury resulting from golf cart use, being hit by a stray ball – golf may “seem” like a stress-free pastime, but there are real dangers that can – and do – happen. 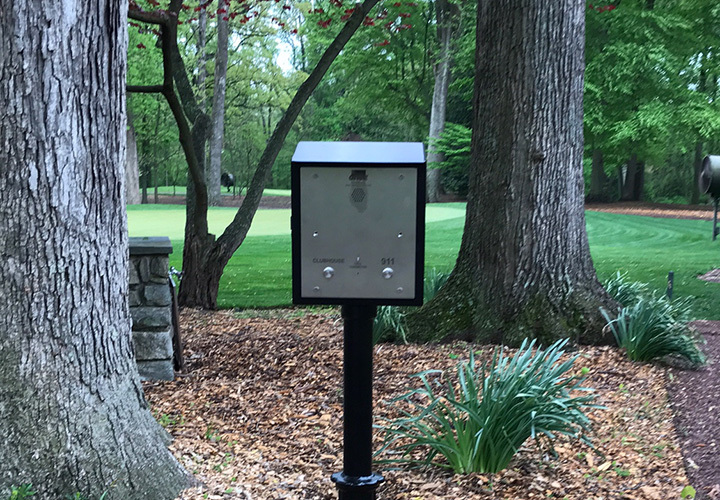 If golfers are far from the clubhouse, an emergency phone system gives them a way to call for help, without waiting for other players or course officials to find them first. 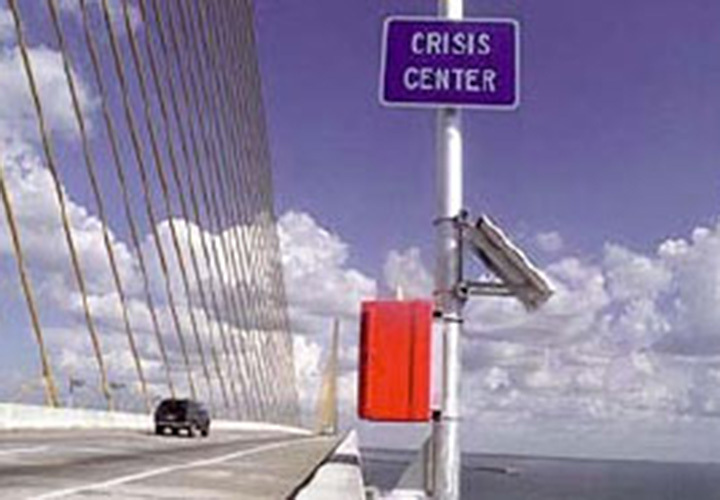 We’re routinely asked about installing a CASE Emergency Blue Light Tower phone or emergency call box on or near bridges – not simply for motorist safety but also for those who may be jumping from the bridge illegally for recreation, or in an attempt at suicide. In both of these scenarios, the call for help would normally be unlikely – but an emergency communication point on site allows other witnesses nearby to do the right thing at the push of a button. It’s the very nature of the armed forces to patrol, protect, and serve in remote locations. They also generally must keep sensitive information separate from the public. 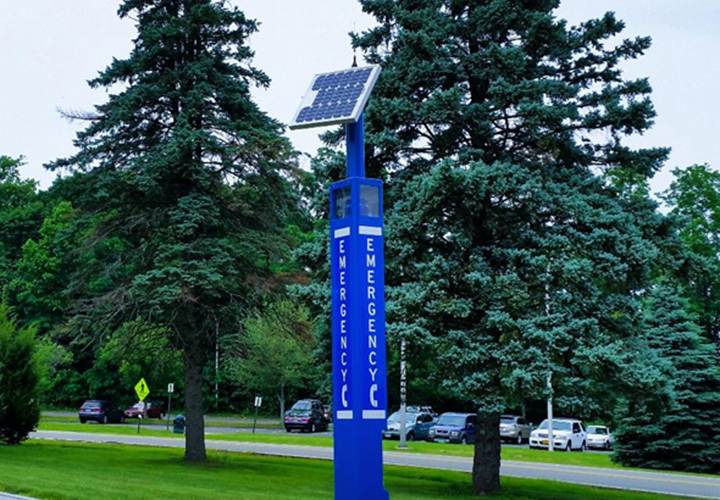 Together, these two realities often mean that without an emergency Blue Light Tower, E-Phone, or emergency call box in place, civilian visitors to the base, or military personnel deployed on a distant outpost have no other recourse if emergency aid is required. With completely wireless functionality CASE Emergency Systems products solve this challenge with ease.